The Global Volcanism Program has no activity reports for Flores. The Global Volcanism Program has no Weekly Reports available for Flores. The Global Volcanism Program has no Bulletin Reports available for Flores. Volcán de Flores is one of the largest of a cluster of small stratovolcanoes located in SE Guatemala behind the volcanic front. Also known as Volcán Amayo, it lies ~10 km W of the city of Jutiapa, at the SW end of the SE Guatemala volcanic platform. The summit rises ~600 m above a basement of Cretaceous and Tertiary sedimentary rocks and contains a shallow crater breached on its eastern side. Satellitic cones occur at the southern and eastern base of the dominantly basaltic volcano, and youthful lava flows occur at the NE base, near El Aguacite. Walker J A, 1981. Petrogenesis of lavas from cinder cone fields behind the volcanic front of Central America. The Journal of Geology, v. 89, no. 6, p. 721-739. The Global Volcanism Program is not aware of any Holocene eruptions from Flores. If this volcano has had large eruptions (VEI >= 4) prior to 10,000 years ago, information might be found on the Flores page in the LaMEVE (Large Magnitude Explosive Volcanic Eruptions) database, a part of the Volcano Global Risk Identification and Analysis Project (VOGRIPA). There is no Deformation History data available for Flores. There is no Emissions History data available for Flores. Volcán de Flores (left), one of the largest volcanoes in SE Guatemala, is a 1600-m-high stratovolcano that lies at the SW end of a cluster of small volcanic fields near the border with El Salvador. This view from the SW shows part of a chain of NW-SE-trending cinder cones that cuts across the volcano's flanks. 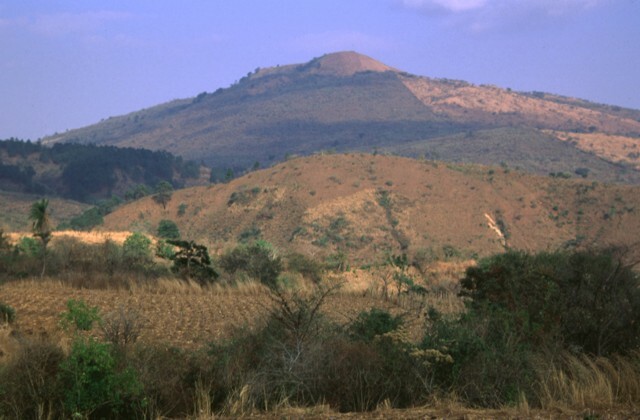 Cones west of Jutiapa have fed basaltic lava flows that blanket the low-lying areas between Jutiapa and Tertiary hills to the south. Volcán Flores (shown on topographic maps as Volcán Amayo) rises above foothills on its western flank. The volcano is one of the largest of a group of small volcanoes behind the volcanic front in SE Guatemala and rises about 600 m above its base. Volcán de Flores, seen here from the SSW, is one of the largest of a cluster of small stratovolcanoes located behind the main volcanic front in SE Guatemala. 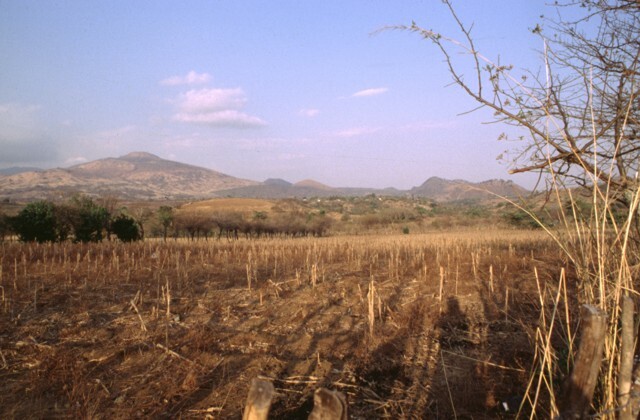 The volcano is also known as Volcán Amayo and lies about 10 km west of the city of Jutiapa. 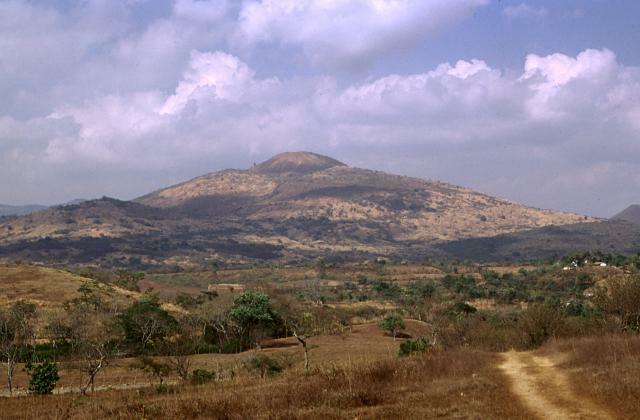 The 1600-m-high summit rises up to 600 m above a basement of Cretaceous and Tertiary sedimentary rocks and contains a steep-sided summit cone capped by a shallow crater breached on its eastern side. A NW-SE-trending alignment of cinder cones trends across the flanks of the volcano. Photo by Francesco Frugioni, 1999 (Istituto Nazionale di Geofisca e Vulcanologia, Rome). There are no samples for Flores in the Smithsonian's NMNH Department of Mineral Sciences Rock and Ore collection. Large Eruptions of Flores Information about large Quaternary eruptions (VEI >= 4) is cataloged in the Large Magnitude Explosive Volcanic Eruptions (LaMEVE) database of the Volcano Global Risk Identification and Analysis Project (VOGRIPA).